11/30 Update: Today is Small Business Saturday! 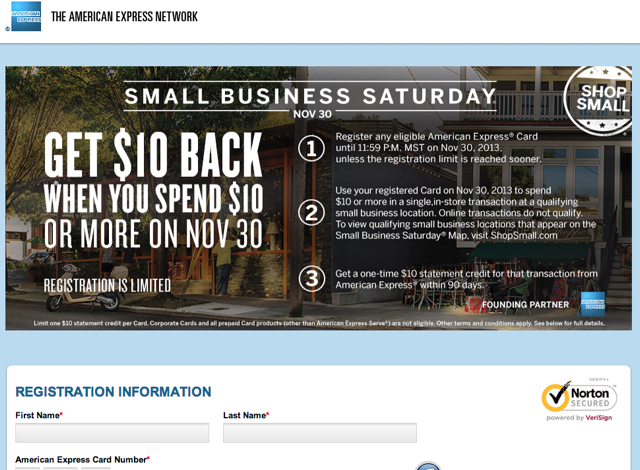 Don't forget to use all your registered AMEX cards today at small businesses (to be safe, those on the Small Business Saturday Map) for your $10 statement credit per card. No online purchases this year, so consider buying several gift certificates if you don't need to purchase anything now. So all else equal, the promotion is worth 40% of what it was last year, and those folks who are out of the U.S. on November 30 won't be able to take advantage of this promotion. Click on the grey “Register Now” button. I would register as soon as possible, since registration for the promotion is limited and may fill up prior to November 30. 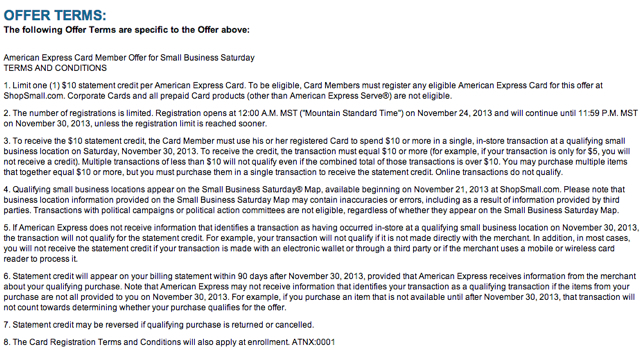 Now is the time to dig out all your active AMEX cards, included authorized user cards, if the primary card is an actual American Express card (note that authorized user cards of credit cards that license AMEX are not eligible–for those cards, only the primary account holder will receive a statement credit, if registered for AMEX Small Business Saturday). Be careful that the merchant is truly a small business. Some of our favorite restaurants in NYC, while not chains, are part of a larger group. For example, Gramercy Tavern and Blue Smoke are both part of Danny Meyer's Union Square Hospitality Group, so these aren't qualifying options for New Yorkers. Same with ABC Kitchen and Jean-Georges, since they are part of Jean-Georges' small empire of restaurants, so these don't qualify either. Last year my statement credits posted in about a week, but per terms, allow up to 90 days. 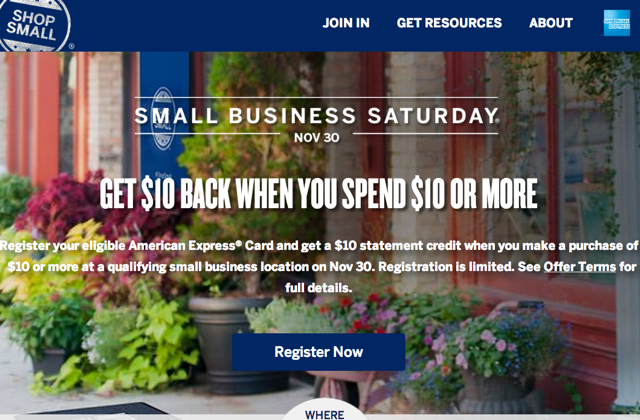 Where do you plan to go for AMEX Small Business Saturday? Or are you sitting it out, given the lower payoff this year?